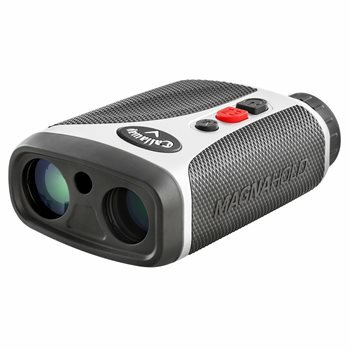 The Callaway EZ Laser rangefinder is easy to grip, easy to aim, and easy to use with EZ Mode. Simply press the "EZ Button" to scan across the flagstick for precise distances. Measurements are available in yards or meters with superior accuracy. The rangefinder scans the landscape to acquire multiple targets and features external distance display. Additional features include a built-in hand support strap to minimize shaking water and fog resistance and magnahold, which includes integrated magnets that allow for quick access and storage on golf carts. P.A.T. (Pin Acquisition Technology) – lock on to the pin up to 275 yards away!